If you have any information about these crimes or any person(s) involved, you are urged to call Crime Stoppers at or submit a Web Tip . You do not have to give your name. CRIME STOPPERS will pay a cash reward of up to $1000 for tips that lead to the arrest of individuals involved in felony offenses and certain misdemeanor offenses. You will remain anonymous. On Monday, December 10th, 2018, the Brookings Police Department took a report of a stolen 2000 Black GMC Envoy, SD license plate 6E1445. The vehicle was taken from a business in the 300 block of 3rd Avenue. As of now the vehicle has not been recovered. 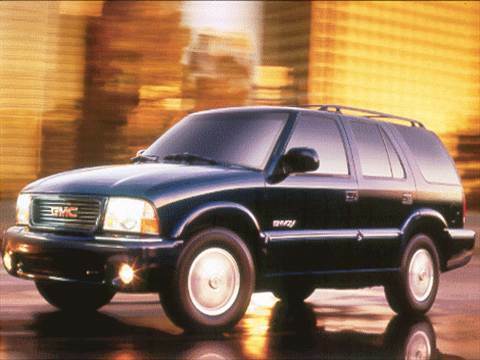 If you have information regarding the location of the stolen GMC Envoy or have information regarding the individual(s) responsible for the theft, please do not post it on this page or it will be deleted. You can submit an anonymous tip by contacting Crime Stoppers. You will remain anonymous and if your information leads to the arrest of the suspect(s) you will receive a CASH reward. Report an anonymous tip by calling 692-STOP (7867), submit a web tip by visiting our website at www.brookingsareacrimestoppers.com, using "Submit a Tip tab on our website, or through P3TIPS app. You can also call the Brookings Police Department at 605-692-2113 to provide information regarding the suspect. The Brookings County Sheriff’s Office is investigating a report of intentional damage that occurred at Six Mile Creek Golf Course in White. Sometime between the evening hours of May 27th, 2012 and the early morning hours of May 28th 2012 unknown individuals drove several golf carts around the golf course in a reckless manner causing damage to a number of golf carts belonging to the golf course. The individuals drove the golf carts through a shelter belt of trees and shrubs on the course. The golf carts collided with a number of trees, several of which were damaged or destroyed. 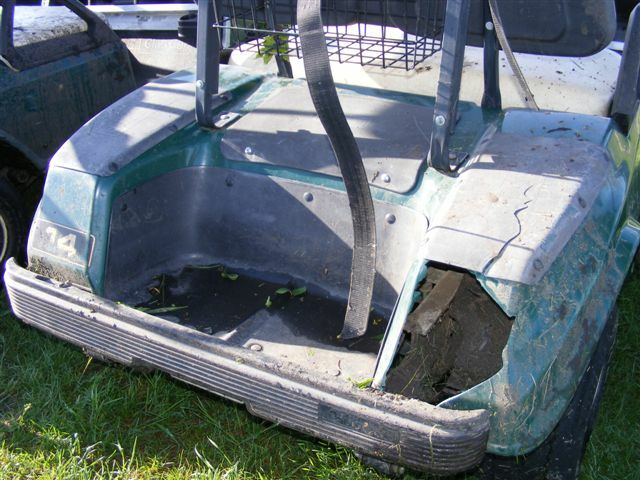 The estimate of damage to the golf carts and the golf course is in excess of $5000.00. If you have any information regarding this crime you can submit an anonymous tip by contacting Crime Stoppers. You will remain anonymous and if your information leads to the arrest of the person(s) responsible you will receive a cash reward. Report an anonymous tip by calling 692-STOP (7867), submit a webtip by visiting our website at www.brookingsareacrimestoppers.com, or text a tip by texting “BROOKINGS plus your message” to 274637(CRIMES). The Brookings Police Department is investigating a report of intentional damage that occurred at Sexauer Seeds which is located in the 100 block of Main Avenue South. Sometime between the afternoon hours of May 26th, 2012 and the early morning hours of May 27th, 2012 an unknown individual(s) gained access to the Sexauer Seeds elevator, activated the release, which caused the seed to be released on the ground below. The loss to the business as a result of the release of the seed is in excess of $1000.00. The Brookings County Sheriff’s Office is investigating a report of a theft of copper electrical cable that was stolen from a LG Everest Gravel Excavation site located on 34th Avenue South, just to the west of Brookings. This incident occurred between Friday, November 4th, 2011 and Monday, November 7th, 2011. The electrical cable was part of a large conveyors system that transports gravel from the excavation site. Approximately 2500 feet of nickel size and two inch diameter electrical cable had been removed from the conveyor system and was taken or destroyed. The estimated cost of replacing the stolen and damaged electrical cable is $37,000. It is presumed that the electrical cable was taken for its copper value. 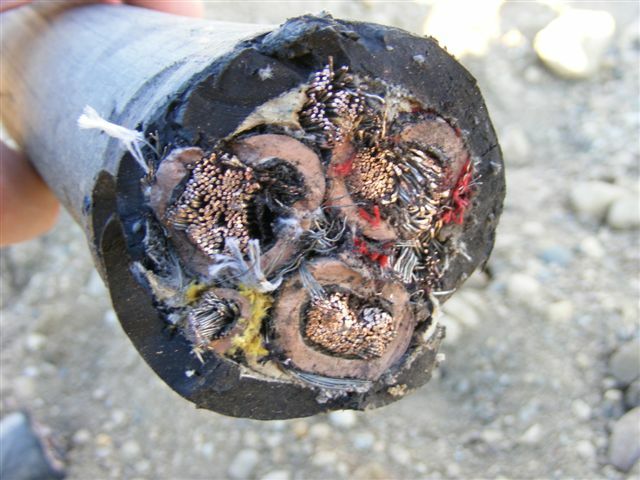 A photo of an end of this electrical cable is included with this information. The Brookings Police Department is investigating a residential burglary that occurred during the night of Thursday, October 13th, 2011 or the early morning hours of Friday, October 14th, 2011. During this timeframe a mobile home located in the 500 blk of 12th Street South was entered by forced entry. Among the items taken from the residence were Italian collector Vino Santo wine bottles, a bowie knife collection, Playstation 3 gaming system and games, a green duffel bag, a silver laptop, two digital cameras, and sports memorabilia. The Brookings County Sheriff’s Office is investigating a burglary of a storage shed that occurred between Sunday, September 11th, 2011 and Saturday, September 17th, 2011. During this timeframe someone made forced entry into a storage unit in Volga, SD and removed over $3000.00 in personal property. Among the property taken was a large amount of golf equipment that included two cart bags, men’s clubs and a women’s set of Intech clubs. Other items taken during this burglary were portable table grill, inflatable football goal posts and a red tool box. The Brookings County Sheriff’s Office is investigating the theft of a maroon 2004 Chevrolet Suburban from a rural Bruce residence located near Oakwood Lakes. 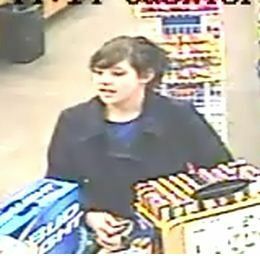 The theft occurred between Saturday, September 3rd, 2011 and Sunday, September 4th, 2011. The vehicle was recovered on Saturday September 17th, 2011 near the Big Sioux River west of Brookings. The vehicle had been burned and was completely destroyed. If you have any information regarding this crime, you can submit an anonymous tip by contacting Crime Stoppers. You will remain anonymous and if your information leads to the arrest of the person(s) responsible, you will receive a cash reward. Report an anonymous tip by calling 692-STOP(7867), text a tip by texting “BROOKINGS plus your message” to 274637(CRIMES) or submit a webtip by visiting our website at www.brookingsareacrimestoppers.com. The Brookings Police Department is investigating a burglary that occurred at the Sexauer Elevator located in the 100 blk of Main Avenue South between the evening hours of Monday, April 25th 2011 and the early morning hours of Tuesday, April 26th 2011. During this timeframe an unknown individual(s) entered the building and caused several thousand dollars of damage. A large number of light fixtures and windows were among the items which were damaged in the building. The Brookings Police Department is investigating an assault that occurred in the 300 blk of 3rd Street during the early morning hours of Saturday, January 29th, 2011. On January 29th, 2011 the Brookings Police Department received a 911 call reporting an individual was punched in the face and was on the ground in the 300 blk of 3rd Street. Officers responded to the location and found an unconscious male lying on the ground. This male was identified as a 24 year old Brookings resident. Witnesses at the scene indicated that the victim had been walking west on 3rd Street when he was hit unprovoked. The only description given of the suspect was being 5’8” to 6’0” tall and wearing a black top. After the assault the suspect fled to the southwest towards the Park and Recreation building in the 200 blk of Main Avenue. The victim was transported to the Brookings Emergency Room for injuries he received as a result of the assault. The Brookings Police Department is asking anyone who has information about this crime to call the Brookings Police Department at 692-2113 or they can report information anonymously by calling Brookings Area Crime Stoppers at 692-STOP, submitting a webtip by visiting www.brookingsareacrimestoppers.com, or by texting a tip to CRIMES (274637) and beginning the tip with the keyword BROOKINGS followed by the information on the tip. The Brookings Police Department is investigating the theft and fraudulent use of a stolen credit card that occurred during the early morning hours of December 12, 2010. The card was stolen from the victim at a local bar and a number of fraudulent charges were then made on the card. A suspect has been identified by video surveillance as a brunette haired female wearing a black coat and kaki colored pants. Pictures of the female can be seen belwo. If you have any information regarding these crimes, you can submit an anonymous tip by contacting Crime Stoppers. You will remain anonymous and if your information leads to the arrest of the person or persons responsible, you will receive a cash reward. Report an anonymous tip by calling 692-STOP(7867), submitting a webtip by visiting our website at www.brookingsareacrimestoppers.com or texting a tip to CRIMES (274637), keyword ‘brookings’ followed by your message. The Brookings Police Department is investigating two commercial burglaries that occurred at the Brookings Pizza Ranch, 1800 block of 6th Street, during the early morning hours of Tuesday, October 26, 2010 and Thursday, November 11, 2010. During both burglaries, the business was closed and forced entry was made. Taken was an undisclosed amount of cash and two office safes, one during each incident. If you have any information regarding these crimes, you can submit an anonymous tip by contacting Crime Stoppers. You will remain anonymous and if your information leads to the arrest of the person or persons responsible, you will receive a cash reward. In addition, Pizza Ranch has posted a $1000 reward for information leading to the arrest of the person or persons responsible. Report an anonymous tip by calling 692-STOP(7867), submitting a webtip by visiting our website at www.brookingsareacrimestoppers.com or texting a tip to CRIMES (274637), keyword ‘brookings’ followed by your message. The Brookings County Sheriff’s Office is investigating the Burglary of a rural Brookings County residence sometime between Tuesday November 23, 2010 and Wednesday November 24, 2010. The residence was being renovated and was unoccupied. Items taken include: a large amount of loose change; gold, silver, brass, copper and pipestone jewelry; a 17 foot ladder and a home stereo and speakers. If you have any information regarding this crime, you can submit an anonymous tip by contacting Crime Stoppers. You will remain anonymous and if your information leads to the arrest of the person(s) responsible, you will receive a cash reward. Report an anonymous tip by calling 692-STOP(7867), submitting a webtip by visiting our website at www.brookingsareacrimestoppers.com or texting a tip to CRIMES (274637), keyword ‘brookings’ followed by your message. The Brookings County Sheriff`s Office is investigating the theft of a steel single axle utility trailer taken from the wind tower work site located near 198th Street and 477th Avenue in Brookings County. The trailer had been holding a port-a-potty, which was removed from the trailer and left behind. The trailer is black with white wheels. It was stolen the week of October, 11, 2010. The Brookings Police Department is investigating several vandalisms that occurred sometime between the nighttime hours of April 28th, 2010 and the early morning hours of April 29th, 2010. 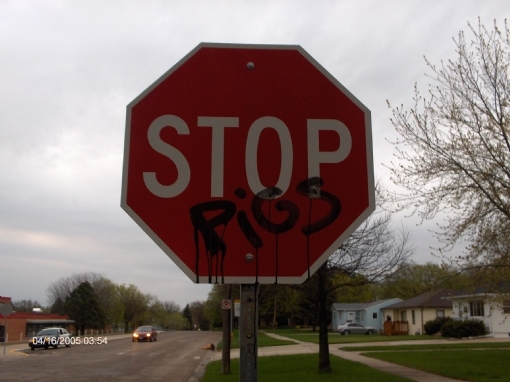 During this time period approximately 30 stop signs were vandalized with black permanent marker and black paint. The damage caused to these stop signs was in excess of $1000.00. Also during this time period a patrol vehicle was also vandalized with black paint. We are looking for information regarding the person or persons resonsible for these vandalisms. 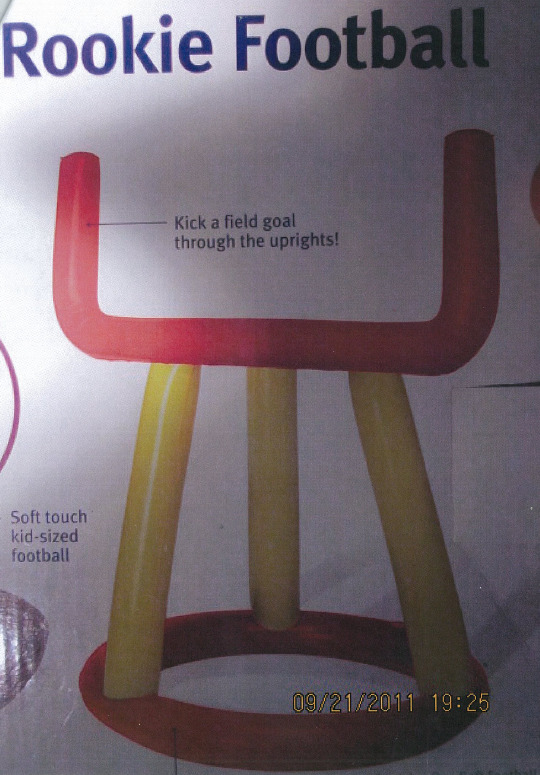 The Brookings Police Department is investigating a theft from Dunham`s Sports located in the 1700 blk of 6th Street. The theft took place on Saturday, March 6th, 2010 during the afternoon hours. Among the items taken were 30+ pocket knives. We are looking for information regarding the person or persons responsible for this theft. 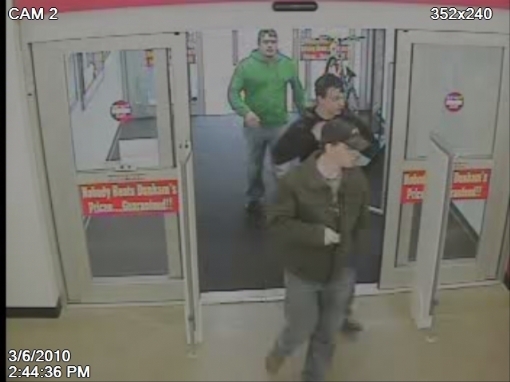 Attached is a surveillance photo from the store showing the suspects. The Brookings County Sheriff’s Office is investigating two burglaries which occurred during the early morning hours of Wednesday, January 13th 2010. The businesses which were burglarized were The Ridge Bar in Bruce and Brownies Bar in Aurora. Both of these burglaries occurred between the hours of 2:00 am and 4:30 am on this date. 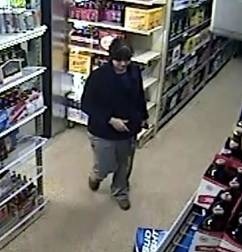 Numerous bottles of alcohol and packs of cigarettes were taken from one of the establishments. The burglaries are believed to be related. We are looking for information regarding the person or persons responsible for these thefts. If you have information regarding these crimes you can report it anonymously to Crime Stoppers. The Brookings Police Department is investigating a burglary of Sturdevant’s Auto Parts which is located in 300 blk of <?xml:namespace prefix = st1 ns = "urn:schemas-microsoft-com:office:smarttags" />W 6th Street. This burglary took place between the evening hours of Saturday, November 7th through the evening hours of Sunday, November 8th. Among the items taken from this business were a new Edelbrock high performance carburetor, 2 new Holley high performance carburetors, a new CVR protorque starter, and cash. We are looking for information regarding the person or persons responsible for this burglary. The Brookings Police Department is investigating several storage unit burglaries which took place during the early morning hours of Friday, August 28th. These burglaries took place at South Main Mini Storage which is located at <?xml:namespace prefix = st1 ns = "urn:schemas-microsoft-com:office:smarttags" />425 12th Street South. A number of storage units at this location were entered and had items taken from them. Among the items taken were a remote control helicopter which was orange in color, a yellow remote control airplane which did not have a wing, a red white and blue remote control airplane, remote control airplane engines, and a silver Sanyo flat screen television. We are looking for information regarding the person or persons responsible for these thefts. Brookings Area Crime Stoppers is helping local law enforcement by taking a proactive stance against illegal drug activity. If you have any information regarding illegal drug activity to include the possession, manufacturing, and distribution of illegal drugs in the Brookings area you can report this anonymously by calling Crime Stoppers. Brookings Area Crime Stoppers will pay cash rewards to individuals who provide information that leads to the arrest of individuals involved in illegal drug activity.